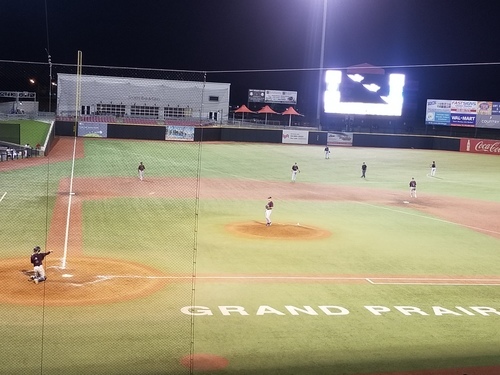 GRAND PRAIRIE, TX - The Kansas City T-Bones (30-17) faced off against the Texas AirHogs (12-34), winning three out of the four games to secure the series. Coming on the heels of their 30th game win, the T-Bones lost their four game win streak. The AirHogs would be the first to strike in the bottom of the third inning. A double by Dillon Thomas, hit off of T-Bones’ starting RHP Lucas Irvine (6-3), would score him a single RBI, sending Stewart Ijames homes making the score 1-0. Back to back putouts would close out the inning for the AirHogs. The T-Bones would heat up soon after. In the top of the fourth, Taylor Featherston would hit a ball into a deep back corner for a triple. Keith Curcio would then hit a single to score Featherston. Curcio would steal second and then be brought home by Adrian Nieto, making the score 2-1. Kansas City kept scoring into the fifth with Zach Walters single RBI to score Mason Davis, who had advanced to third on a pass ball. However, the AirHogs were far from out of the fight. Late in the sixth, the AirHogs rallied with a double RBI from Luan Chenchen, the T-Bones would now being playing tie ball. Ijames would be back in action this time smashing a ball out of the park to score him and two other AirHogs, bringing the score to 6-3. T-Bones’ Mason Davis would use his speed to get the team moving again. After hitting a single, stealing second, and advancing on Nick Torres’ single, he would score on a pass ball. A single RBI by Curcio would score Torres until the T-Bones were only trailing by one. T-Bones would go scoreless for the remainder of the game, falling 6-5. T-Bones’ pitcher Irvine would give up five runs to Texas with relief coming from Jackson Lowery and Pasquale Mazzoccoli. Irvine is credited with the loss. AirHogs starting RHP Miguel Rosario (1-6) would be replaced by Lu Yusong (2-0) in the fifth. Yusong would only give up two hits and is credited with the win. The T-Bones will enjoy a rest day tomorrow but will be back in action the following day, Monday, July 9th. They travel to take on Lincoln Saltdogs (26-21) at 6:45 p.m. at Haymarket Park. Individual tickets, season, group, mini-plans and nightly party suites are on sale now and can be purchased by visiting the Box Office at T-Bones Stadium or 24/7 at www.tbonesbaseball.com . Call the Box Office at 913-328-5618. Box office hours are 10:00 am to 4:00 pm Monday –Friday and 10:00 am to 2:00 pm Saturday. For additional information or interview requests, members of the media may contact the T-Bones Media Relations Department at (817) 739-3693. Stay tuned to www.tbonesbaseball.com. and the T-Bones Facebook and Twitter pages for updates throughout the season.